The brain matter prosthetic application is a makeup prosthetic that simulates the effect of a cracked skull that leaves the brain exposed. 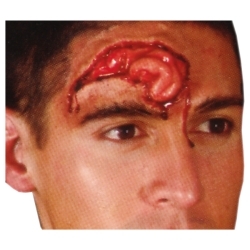 It can be used as part of a gory Halloween costume or as part of a simulated accident scene. The brain matter prosthetic application requires spirit gum or prosthetic adhesive to apply. The gory effect of this prosthetic can be enhanced with the use of stage blood. Woochie's prosthetics fit as no thick edged, scissor trimmed product can. They feature paper thin edges or an invisible net base for the smoothest blend onto the skin. They offer the best shaped, lightest, most flexible and most comfortable prostheses available on the market today. Don't forget the Castor Sealer to prepare you appliance to accept cream makeup and extend the life of the prosthetic.